Cataracts are a common vision problem that often becomes worse over time, leaving some who suffer from cataracts unable to drive or enjoy their favorite activities. Fortunately, cataracts can be treated with surgery. At the Byrd Eye Clinic, we offer comprehensive cataract treatment, from diagnosis to surgery, to restore vision and quality of life. When faced with a diagnosis of cataracts, patients often have many questions. One question we'll consider today is when do cataracts develop? If you have questions about cataracts and treatment, contact Detroit, MI ophthalmologist Thomas Byrd to schedule a consultation. Cataracts most commonly develop as a result of the aging process. For some people, this can begin as early as their 40s, while others may not develop cataracts until after the age of 60. It should be noted that someone in their 60s with cataracts may have had them since his or her 40s of 50s as it can take several years for cataracts to progress enough to impact vision. Although cataracts are often age related, they could also develop as a result of an injury, genetics, or other health issues. An injury to the eye, such as a scratch or puncture, can damage the lens and lead to the development of cataracts at any age, including in childhood. Cataracts may also be present at birth, as is most often seen in situations where cataracts are genetic in nature. Certain health conditions can also cause cataracts to develop. One of the biggest health-related causes of cataracts is diabetes. Cataracts caused by diabetes can develop as early as the age of 20, while others with diabetes may not develop cataracts until they are in their 70s. 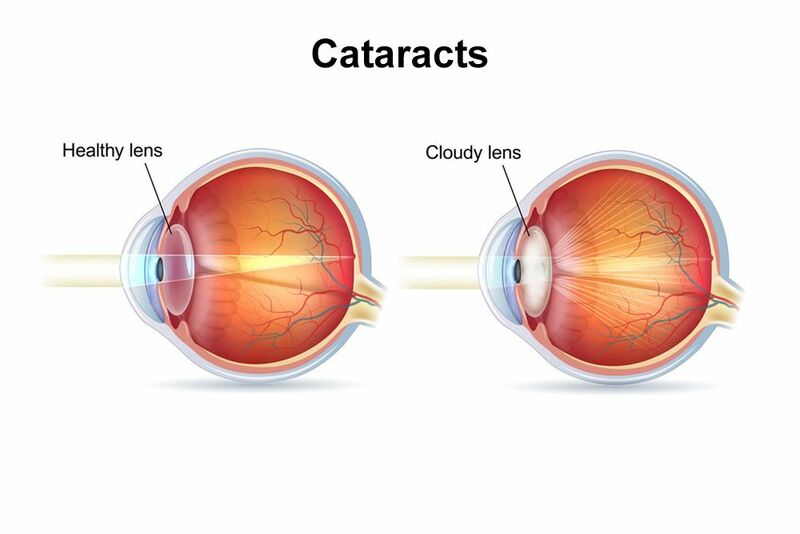 Cataracts are also more likely to develop in those who are obese, have high blood pressure, have used corticosteroid medications for an extended period, are heavy alcohol drinkers or smokers, or have had excessive exposure to sunlight and ultraviolet light. When cataracts interfere with vision and impact quality of life, it may be time for cataract surgery. Cataract surgery is the primary treatment option for cataracts. Cataract surgery is relatively minor and performed on an outpatient basis so patients may recover in the comfort of their own homes. During the procedure, the pupil is dilated using special eye drops. Once dilated, a small incision is made within the eye and the damaged, clouded lens is removed. Next, an artificial lens, called an intraocular lens, or “IOL,” is placed within the eye to restore vision. If you suspect you have cataracts, treatment for cataracts may be right for you. To learn more about cataract treatment, please schedule a consultation with Dr. Byrd today.